A visit to Tulsa will give you a wide range of options for where to stay, from small bed and breakfasts run by locals to historic buildings that are now hotels to major hotel chains. Opt for a cozy hotel with just a few rooms or a bigger building with plenty of amenities, such as convention centers, pools, fitness centers, or even a casino. This boutique hotel is pet-friendly and part of the Marriot chain of hotels, specifically their Autograph Collection. This luxury hotel is within one of the city’s most historic buildings and includes updated amenities with a downtown location. 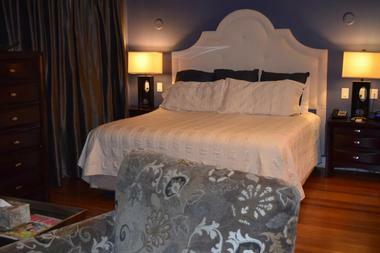 The newly renovated rooms and suites have plush bedding, ergonomic workstations, and living areas. All guest rooms have air conditioning, living/sitting areas, evening turndown service, hairdryers, lighted makeup mirrors, safes, irons, desks, complimentary bottled water, tea and coffeemakers, minibars, minifridges, phones, iPod docks, and at least 32-inch TVs with premium movie channels, cable, HBO, ESPN, and CNN. You can also upgrade to a more spacious room or one with a separate living area. Take advantage of the free shuttle service to explore Tulsa attractions without having to worry about parking. While on the property, visit the fitness center or take advantage of business amenities. Get room service any time of the day or enjoy a sit-down meal at The Chalkboard, where you will find handcrafted cocktails and American dishes. You also have the choice of either a continental or full American breakfast for a small fee. 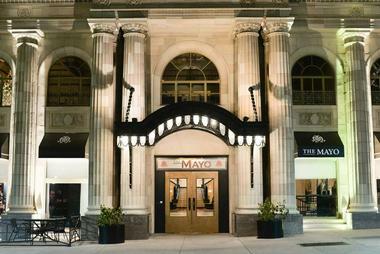 The Mayo Hotel opened its doors back in 1925 and has since hosted thousands of guests from a range of prominent fields. It was vacant from 1981 to 2009, when it underwent an extensive historical renovation. Now the 102 ultra-chic guestrooms pair with nine event spaces and 76 luxury residences. The rooms feature bold patterns and bright accent colors with neutral backdrops for a modern and retro-chic feel. You will also find wood floors, custom eucalyptus robes and bed linens, complimentary water bottles, electronic safes, iPod docking alarm clocks, Keurig coffeemakers with K-Cup pods hairdryers, irons with ironing boards, and walk-in showers featuring body sprays. Guests are treated to complimentary Escalade car service to or from the airport and within a 4-mile radius of the hotel, with reservation. There is also valet parking on site and a 24-hour business center. Get in your workout anytime at the 24-hour fitness center. Let the valet laundry take care of your dirty clothes. The Boiler Room is a restaurant and bar with pieces from the original steel boiler and key artifacts, where you will find American favorites with plenty of flair and fresh ingredients. Alternatively, head to the Penthouse Bar on the roof for live music, 360-degree views, and drinks. This luxurious boutique hotel is also an event center. Its 26 rooms have unique decorations to ensure guests have a relaxing stay. The hotel was built back in 1927 but underwent a full renovation in 2011 so you can expect modern amenities with historical charm. All rooms have custom window treatments, designer linens, elegant furnishings, refinished hardwood floors, vessel sinks, natural stone counterparts, Keurig coffeemakers, fridges, microwaves, recessed heating within the bathroom, and security boxes. You can also opt for a room with an air mattress and bring your pooch along. The entire property has wireless internet that guests can enjoy without additional charge. The property also has a full spa and salon services, so you can get pampered at Spa Maxx. The day always begins with a continental breakfast. The Campbell Lounge is an intimate setting with an extensive drink menu and is perfect for relaxing at the end of a long day. 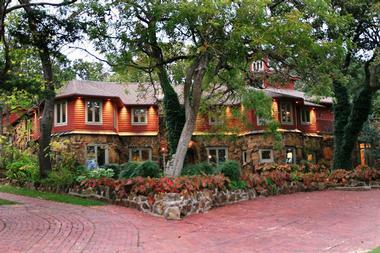 The Cedar Rock Inn is a luxury bed and breakfast that is under 10 minutes from downtown Tulsa. Each of the five luxury suites gives you the chance to relax while feeling pampered. All rooms sleep two guests and most have queen beds, although one has a king. Other room amenities include private baths, flat-panel TVs with DVD players, hairdryers, and phones. Choose a room with a double shower, a clawfoot tub/shower, a Whirlpool tub, a cedar-lined steam/sauna, a large private sitting room, a remote-controlled fireplace, a private entrance, a wet bar with fridge, and/or a private terrace or balcony. During downtime, relax in the living room with its numerous soft seating options or take advantage of the dining room. The property-wide wireless internet will keep you connected. Head outside to explore the inn’s hiking trails or sit by their pond with its small waterfall. With 55 acres of land on the property, there is plenty to explore on a hike. 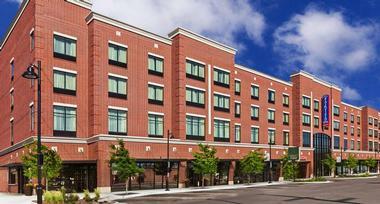 Guests also get free covered parking and there is the option of in-room massages. The day begins with a three-course gourmet breakfast that is included in every stay. You will also receive snacks upon check-in and can enjoy the bottomless homemade chocolate chip cookies. The DoubleTree by Hilton at Warren Place delivers the comforts and amenities you expect from a hotel in this chain and sits within South Tulsa for easy access to a range of attractions. The spacious guest rooms have wireless internet along with flat-screen TVs. Other standard amenities include dual phone lines, upgraded single-cup coffeemakers, irons, full-size ironing boards, and your choice of two double beds or one king. Business travelers will appreciate the suites with boardroom tables. All guests can relax in the indoor pool, whirlpool, or sauna or can work up a sweat at the fitness center. If you want to head outside, there is a scenic walking path immediately behind the hotel. 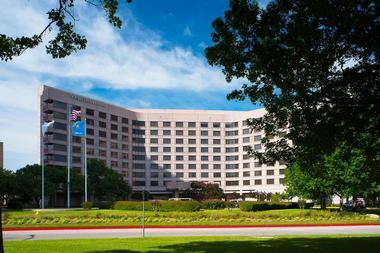 For added convenience, there is a complimentary airport shuttle and the hotel is pet-friendly. Other amenities include a coin laundry, a gift shop, valet and laundry service, a newsstand, a safety deposit box, a snack shop, and a luggage hold. Visit Warren Duck Club Restaurant for a regional meal without leaving the building and finish up your day at the Lobby Lounge with a drink of your choice. The 24-hour Pavilion Pantry Market is there whenever you get hungry. Those who opt for the breakfast and Wi-Fi package get premium internet and included breakfast. The DoubleTree by Hilton Downtown puts you right in the middle of downtown, making it easy to access local attractions, whether you are in town for business or pleasure. The spacious guest rooms have convenient workstations with ergonomic chairs, two phone lines, and a desk plus complimentary Wi-Fi. There are PURE allergy-friendly guest rooms as well as suites, accessible rooms, and connecting rooms. The hotel is pet-friendly for a small fee. All rooms have Sweet Dreams beds with down comforters, plenty of jumbo pillows, and plush-top mattresses. Suites can feature a connecting parlor and include a walk-in closet, extra seating, and dry bar. There is a complimentary shuttle to go to downtown offices and the airport. Take advantage of the safety deposit box, snack shop, lounge, luggage hold, coin laundry, and bar area. Visit the video arcade, swim in the pool, or work out in the fitness center. Eat any meal at the Made Market, where you can enjoy a sit-down affair or a grab-and-go choice. You can also have the items delivered to your guest room. When you arrive, you are treated to signature chocolate chip cookies. 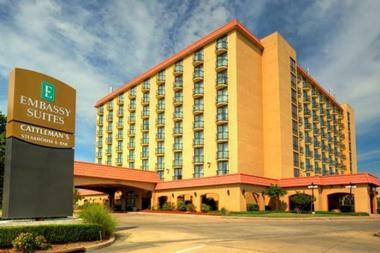 The Embassy Suites is in the heart of Tulsa and is only suites, ensuring that all guests have plenty of space. The two-room suites are designed to make guests feel as if they are at home with separate bedrooms and living rooms. Choose from either a king or double bed and make use of the work desk and wireless internet. Other amenities include two TVs, sofa beds, armchairs, well-lit worktables, coffeemakers, microwaves, and fridges. Use the heated indoor pool or exercise in the fitness center. The BusinessLink Business Center is very useful, and there is also a video arcade. The day begins with a made-to-order breakfast that is complimentary. The evening reception is in the atrium with complimentary snacks and drinks. Get a meal at Cattleman’s Steak House & Bar with a self-explanatory menu or have a light meal at the Patio Grill, which is particularly popular for lunch. There is also a Starbucks on site. The Hard Rock Hotel and Casino provides comfortable accommodations and plenty to do. There are 454 rooms and suites, each with state-of-the-art amenities such as high thread count linens, triple-sheeted beds, 37-inch plasma TVs, iPod docking stations plus alarm clocks, complimentary high-speed internet (wireless and wired), in-room safes, minibars, coffeemakers, fridges, makeup mirrors, hairdryers, irons, and ironing boards. Choose from a room with a king bed or two queens or opt for a suite, some of which have full-body spa showers and whirlpools. VIP suites are even more lavish. You can have plenty of fun in the casino with its electronic games, 40 tables with games, and poker. The property also includes the Cherokee Hills Golf Course, The Spa with its wide range of treatments, and Riffs for some nightlife. There is a buffet for every meal, including brunch on weekends and lunch on weekdays, with a range of options and five stations to explore. 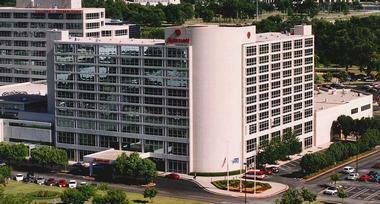 Each of the guest rooms at the Marriot Tulsa Hotel Southern Hills has a coffeemaker, an alarm clock with an MP3 jack, a 37-inch flat-screen HDTV, a minifridge, and luxurious bedding. Choose either a king bed or two doubles, with their air conditioning, comfortable chairs, hairdryers, bath amenities from Bath and Body Works, ironing board and iron, high-speed internet, complimentary wireless internet, and radio. Visit the full-service spa for a relaxing afternoon or a swim in the heated indoor pool. There is also a modern fitness center complete with iPod connections and built-in TVs, plus a sauna. The hotel also offers a free shuttle to the River Spirit Casino for your convenience. The on-site restaurant, Tallgrass Grille, Bar & Private Dining is open for breakfast, lunch, or dinner, or get a drink at Remington’s Sports Bar. There is even a WPS Starbucks to start off your day. 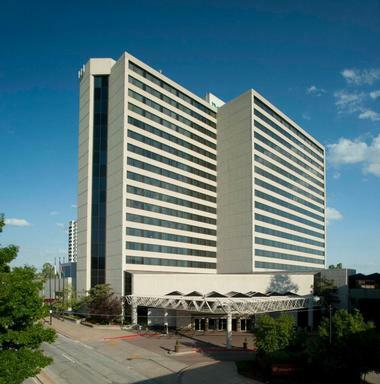 The Renaissance Tulsa Hotel & Convention Center offers stylish accommodations and easy access to the Oklahoma Aquarium and Woodland Hills Mall. The guest rooms have pillow-top mattresses and custom duvets. Choose from a king or double room and enjoy soundproof windows, high ceilings, air conditioning, newspapers upon request, hairdryers, bathtubs, chairs and ottomans, alarm clocks, safes, desks, irons, coffeemakers, bottled water, minifridges, 27-inch TVs with premium movie channels, radio, and wireless or wired internet. Those who stay on the concierge level can also enjoy the exclusive lounge, while all guests will appreciate the full-service business center. Get in a workout at the 24-hour fitness center whenever you want or opt for a dip in the pool. The on-site restaurant, The Cyprus Grille, delivers upscale dining without having to leave the building. There is also a store for conveniences and sundries and Merlot’s Lounge is open for cocktails and a light meal. 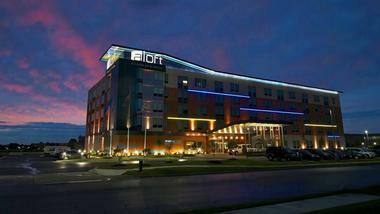 The Aloft Tulsa Downtown is just across the street from the Tulsa Convention Center and within a block of the BOK Center and other local attractions. It was built right out of the City Hall building, with its historic preservation status. 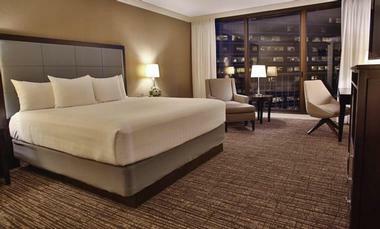 Choose from a double queen or king room or go with a corner suite or ADA room. Standard amenities include modern styling, fast and free wireless internet, free coffee and bottled water, minifridges, plush platform beds, 42-inch LCD TVs, ergonomic workstations, and Bliss spa amenities. The corner suites have two double beds plus a sofa bed, a fridge, an extra 42-inch LCD TV, and a separate living area. 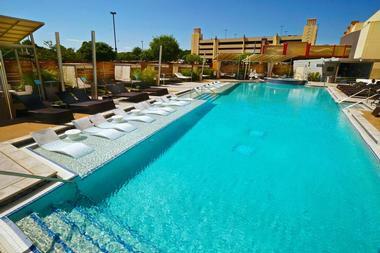 During your downtime, get in a workout at the Re:charge gym or go for a swim in the Splash outdoor pool. The hotel is pet-friendly, so you can bring your pooch with you. At the end of the day, visit the W XYZ bar for a refreshing drink and great live music or play pool with a drink at the Re:mix lounge. No matter the time of day, head to Re:fuel for a grab-and-go meal of the light variety or visit Mamadou’s Restaurant & Sports Bar for prime rib or steak. 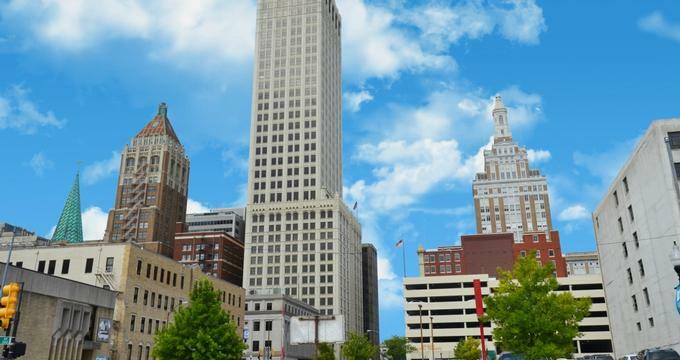 Aloft Tulsa is just 15 minutes away from major Tulsa attractions and there is a free hotel shuttle service to the various local attractions, so you won’t even need to rent a car unless you want to. 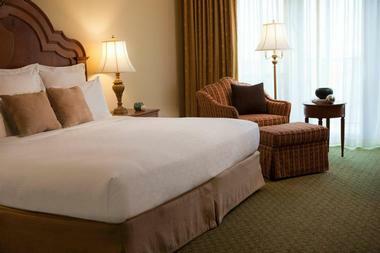 Accessible guest rooms are available or stick to the Aloft Rooms with your choice of a king bed or two queen beds. These rooms also have 42-inch LCD TVs, minifridges, ergonomic workstations, fast and free Wi-Fi, free bottled water, and free coffee. The entire property has free wireless internet, so your connectivity is never limited. Visit the outdoor pool, Splash, to cool off and get in some exercise or choose a more traditional workout at the 24-hour fitness center with state-of-the-art cardio equipment and other workout equipment. Unwind with the indoor hot tub or sauna. 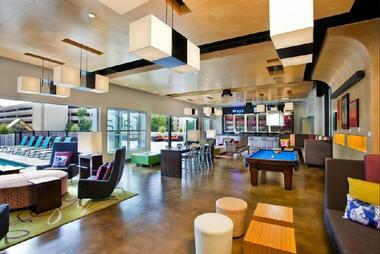 Visit the Re:mix lounge to relax and browse the web or socialize over a game of pool. You can get a drink there or at the W XYZ bar, depending on which type of atmosphere you prefer. Don’t forget to check the schedule for live music at the W XYZ bar. If you are on the run, stop by Re:fuel by Aloft for light grab-and-go meals any time of the day. 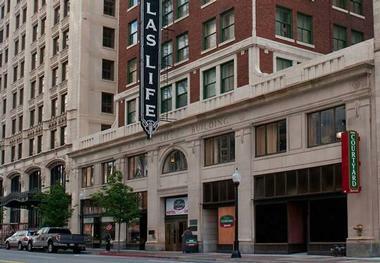 The Courtyard Tulsa Downtown sits within the historic Atlas Life Building with its art deco design that dates back to 1922. Today, it has 119 rooms for tourists and business travelers alike. The property has free wireless internet, so you can stay connected. All rooms have pillow-top mattresses, air conditioning, individual climate control, showers, marble bathrooms, hairdryers, oversized chairs, ergonomic desks and chairs, irons, ironing boards, alarm clocks, coffeemakers, minifridges, TVs, and iPod docks. You can also opt for a suite with extra space and a sofa bed, two bedrooms, or an historical registry room. During your downtime, head to the seventh floor to get a glimpse of the building’s history or enjoy the art deco design elements remaining in the lobby. Getting to and from the hotel is easy thanks to the airport shuttle. There is also a fitness center, so you won’t have to miss your workout. Get what you need at the Sundry and Convenience Store, visit the bistro for Starbucks coffee, dinner, wine, or beer, or head to the New Atlas Grill for a casual deli meal on weekdays or the Deco Deli and Market for a casual American meal. Guests at the Fairfield Inn & Suites Tulsa Downtown are treated to spacious rooms with thoughtful appointments and value-added amenities. The entire property, including the rooms, has free wireless internet. The 80 guest rooms and 24 suites include iPod docks, 32-inch LCD TVs, coffeemakers with tea service, microwaves, fridges, Paul Mitchell or Neutrogena bath products, and large work areas. Suites add even more room and sofa beds. Go for a swim or get in a traditional workout at the fitness center. There is a complimentary airport shuttle for added convenience. Start your day with a complimentary breakfast featuring hot options like oatmeal, sausage, and scrambled eggs, or enjoy yogurt, fresh fruit, and more. Your complimentary breakfast can be a buffet, hot meal, or grab-n-go. There are two on-site restaurants: Laffa-Medi Eastern Restaurant & Bar serves Mediterranean dishes for lunch or dinner while Prhyme Downtown Steakhouse is open for dinner and requires reservations.